The talented father/daughter duo, who hail from Church Point, come from a long line of Cajun musicians. 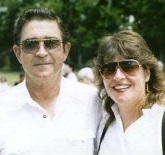 To the surprise of Cajun music fans world-wide, Patrick Richard and his daughter Becky began recording together in 1989 when Cajun music was dominated by male vocalists. Their recordings were well-received and proved that Cajun music fans were prepared to accept a female vocalist. The Richards are proud of their ancestral roots, and have picked up many honors during their career, such as the CFMA’s Best Female Vocalist for 1989, 90, 91, and 92, the Times Music Awards in 1989 and 1993, and the Pioneer Award. The Richards were selected by the TNN network to join Jo-El Sonnier, Jimmy C. Newman, and Doug Kershaw to film Cajun County, an hour long special dedicated to Cajun music, heritage, and culture. Their performance received rave reviews. Today, the Richards are still living in their hometown of Church Point, and embracing their heritage and culture. They are pleased to have had the opportunity make their mark in Cajun music history.